You’d better worry when you think you’ve got your ducks in a row. “I’ve just about got all my ducks in a row,” he says. He’s a COO/GM of a $30M small business with about 75 people. He’s got half a dozen direct reports who appear to be doing good work. They’re hitting their numbers. Sales are solid. Profits are heading in the right direction. Life is good. “Why do you say ‘just about’ – what do you lack?” I ask. Delusional leadership is far more common than you may think. Just watch any episode of Undercover Boss and you’ll realize how true that is. The boss always finds things he or she never suspected. In some cases, it’s one surprise after another. Are you like me in thinking, “Why don’t these guys get out more?” Peters and Waterman called it “management by walking around” when they wrote In Search of Excellence. Clearly there’s not enough walking around going on today in many companies. The COO/GM thinks he’s just about got things exactly the way he wants. That’s what he means by having all his ducks in a row. The fact that he thinks a couple of ducks downline need a bit of coaching isn’t much of a concern for him. The problem is, he’s got one direct report who is happy while the other 5 are hard at work to get as far away from him as they can. In the meantime, they’re doing their work – and doing it well – but they have no intention of following him longterm. Sadly, he’s got no idea. He sees himself as a spectacular success. Success is always a roadblock to effective mentoring or consulting. It’s hard to argue with positive results. The problem is when you see the risks of losing that success. Well, to be fair, the real problem is failing to see the risks of losing that success. Leaders sometimes get blinded by the success and don’t see the coming problems that will wreck the present success. Armed with positive numbers and success (however you measure it), many leaders jump into a defensive posture at any suggestion that things may not be quite what they should be. Find a leader willing to listen, comprehend the possibilities and investigate — and you’ve found a very special leader! With 6 direct reports, this COO/GM was at high risk of losing 5 of them. To put that in report card terms, his score would be 16.66 out of a possible 100. If 60 is failing, then how bad is a sub-20 score? He was failing 83.34% of his direct report team, but he didn’t know it. To be fair, there are probably an infinite number of reasons why people become discouraged, disgruntled and unhappy. Unhappy enough to make concrete plans to leave. Today, I’m just talking about the three that plagued this leader. My hope is that you can look at this story and learn. Honestly, you could fill in the blank with whatever you want to create your own list of reasons why people want off one team so they can find a better one. Make application to your situation. Autocrats are domineering or dictatorial people. They pick at everybody and everything. Thirty years ago I incorporated a phrase into work based on my own experiences with autocrats I had worked for. The autocrat is a nitpick. Never satisfied with anything done by anybody else. His own work is superior. He believes he can do any job better than those who do it. It doesn’t matter if it’s a factory floor, a distribution center, driving a truck or occupying the executive suite – the autocrat can do it all vastly better than anybody else. He’s not reluctant to make sure people know. The autocrat berates and crushes people with criticism. In his mind, he’s driving people to superior performance. At least that’s what he says. I’m certain he believes it. The autocrat embraces the drill sergeant philosophy. In your face, yelling, screaming, asking questions without giving you an opportunity to respond – these are all easy tactics for him. Fear is his weapon of choice and he’s accomplished in its uses. In short, the autocrat is all stick and no carrot. Back in the 80’s I was managing multiple teams in a turnaround project. I was fresh to the task and quickly realized there were no measureables for the team members. They had nothing to aim at. I remember addressing them and telling them a story about bowling in the dark. We’ll go bowling, but we’ll turn out the lights and you’ll be unable to see the pins. Do you still want to go bowl? Of course not. If you can’t see the pins…if you can’t see how well or how poorly you’ve done…what’s the point? Exactly. There is no point if you can’t quantify the work. These kinds of statements characterize the feelings of many team members trapped by an ineffective leader. The one team member who isn’t making any plans to leave is treated better than all the others. For some reason the wrath of the autocrat doesn’t fall his way very often. However, for the others, they’re worn out from hearing “I don’t like that” or “I hate that” without knowing a standard of measurement. Nobody wants their boss to sit across of them and tell them, “I don’t think you’re doing very good work.” You can’t do anything with that information. You need specific feedback based on something other than how a person feels. How you manage how a person feels – especially when they get up in a different mood every day? If it weren’t so sad it’d be funny. They just can’t give a compliment without ending it with something critical. It’s a hard habit to break, even if the leader wants to and in my experience, most don’t want to break it because they do believe it’s the proper way to lead. They’re wrong! Imagine how much MORE success could be had? If 83% of the direct reports are miserable and searching for other places to work, but the numbers (the results) are deemed a “success,” imagine how much more successful the results would be if all the direct reports were fully engaged and more devoted to the organization. I’d like to tell you that more often than not I win that argument, but I don’t. Potential is a tough concept to argue when you’re up against some level of current success. It’s a lot easier when you’re up against blatant failure! I believe in people. I believe in telling people the truth. I believe people want to contribute and find meaning in their work. Many problems of leadership that I encounter stem from a faulty mindset or philosophy that believes people are lazy, they don’t do the right thing, they’ll steal from you, they won’t do good work — UNLESS — you use fear and force. How is it with your team? Do you know how your people feel? Do you care? What are their concerns? Do you have enough of a relationship where candid conversations can happen without your people having any fear? Why not? What’s stopping you from being a more effective leader? And how good are you going to look when 83% of your team leave? 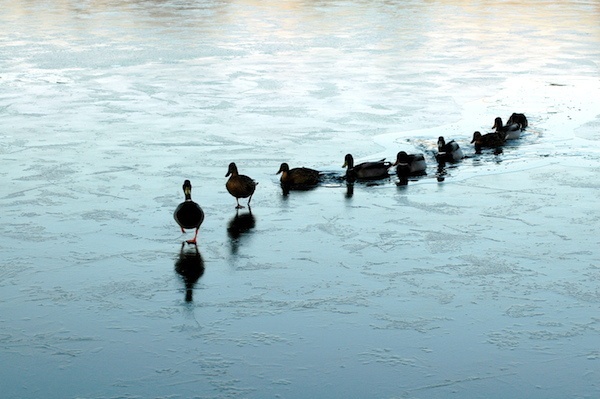 Just because the ducks appear to be in a row right now doesn’t mean they’re going to remain. It’s takes a watchful and caring eye to make sure the formation stays together. It’s the work of effective leaders. It’s also the dream for every team member or potential team members. They want to follow a leader who cares enough about them to help them be all they can be. P.S. It’s good to be back. I’ve been laid up for 3 weeks. If you’d like to know more about that, listen to this episode of my Leaning Toward Wisdom podcast.